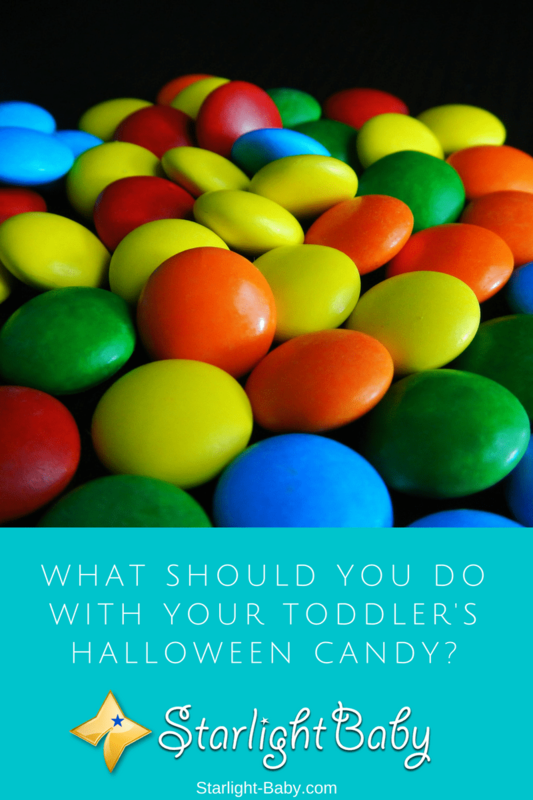 What Should You Do With Your Toddler’s Halloween Candy? Did you know that the letter M in M&Ms and the letter S in Skittles float when these candies are dissolved in water? If this is something that interests you as a parent, then this kind of magic trick will most probably work well with your little toddler, too! Toddlers often look forward to Halloween because it’s the day they receive lots of sweet treats, as they knock on doors wearing their cute or scary Halloween costumes. Though this may be a fun and much-sought activity for younger kids, parents need to be aware of the potential health risks that the bag full of candies may bring to their children. Halloween Candies: Treats Or Health Tricks? 1. Candies cause tooth decay. This one’s pretty obvious. Filling up their mouth with Halloween candies all night long will surely entice the cavity-causing bacteria to hover in your children’s sweet tooth the next day. The sugar in candies stick to the teeth, feeding the bacteria that will eat up your little toddler’s teeth. Caramelized candies are especially good at causing this problem, since they are too sticky and harder to remove from the tooth surface. 2. They can be a source of weight problems. The high sugar content of candy bars will boost the caloric intake of your child in a negative way. Candies are good sources of “empty calories”, meaning they have no nutritional value. Even if your kids gain weight, their body will not get nutrients sufficient for their daily needs. Instead, what they consume is unhealthy sugar that contributes to fats that would drastically increase their body weight. 3. Sugar-rich candies are health risks. Have you heard about diabetes in children? Halloween candies are culprits to this debilitating disease. The unhealthy sugar also contributes to many other diseases that may harm your little toddler in the long run. Some of the diseases worth mentioning are increased risk of heart disease, osteoporosis, depression and obesity. 4. Over-consumption of sweets causes dietary problems. Eating candies can cause unhealthy eating habits. Just observe your kid when he/she eats a bowl of candies. By the time you ask him/her to eat lunch or dinner, you’ll likely get the response that he/she is still full. Repeat this scenario the next day, and you’ll get the same answer – they feel full! Why? It is because candies have calories (“empty” calories) that make the brain think you’re full when in fact the stomach is empty. With a bag full of candies within reach, children will most likely decline to eat all the meals you’ve prepared for them. The bottom line: Halloween candies are more frightening than the costumes you’ve prepared for your little one. Want to get rid of them right away? It isn’t as easy as you think! Your toddler may throw temper tantrums by the time he/she discovers that you’ve hidden the candies he/she collected! Browse the internet to get a wide variety of fun experiments that will instantly turn you and your toddler into mad scientists. An amazing example would be the floating letters from M&M’s or Skittles when they are dissolved in warm water. Toddlers will also surely be astonished to see melted candies form rainbow colors or chocolate pieces that float and sink in water. This activity may require extra effort, but it’s sure to delight you and your little one. It is a fun way to bond with your toddler while he/she is unknowingly getting rid of the candies. It’s very likely that your toddler will not give up his/her hard-earned candies. So, here’s a nice deal! Ask them to trade it with something they really like – a much awaited play at the park, small toys, a favorite cartoon show, or anything that you can think of. Trading the candies is a lot easier than forcing them to give it up, and it is less stressful for both the parent and the child. 3. If They Don’t Want To Trade It, Buy It! In case you can’t convince your little one to trade the candies, you may offer to buy them instead. For a more creative way, disguise yourself as a happy buyer in a grocery store and your little toddler as the cashier. Use the candy bars as the goods and use play money to buy them (unless they want real money, and you’re willing to give it to them). Toddlers love storytelling so make up a story about the ill effects of candies. Come up with a story about a candy monster that goes from house to house to collect hidden Halloween treats, or a story about a child who became a Halloween monster because he always eats everything in his trick or treat bag. Teaching your child to donate to the less privileged children early on is a wise step, and you may start by giving away a couple of the Halloween candies. You may give them to kids in a nearby orphanage, foster home or nursing home. 6. Make Toys Out Of Candies! This is another sure hit for your toddler. Candies can be turned into toys with the help of your little craft scissors and tons of imagination. A good example is making a candy robot out of rectangular-shaped candies, tootsie rolls and Jack-o’-lantern. It’s easy, crafty and fun! This one could be tricky since you’ll be using the candies for your Halloween dessert recipe and your child would also be eating it. However, the objective is to get the bag full of candies and tell your child that you’ll be using them to cook a nice, sweet dessert. Have him watch the entire baking/cooking process. The trick is to use only a small portion of the candies and get rid of the others. You can use your favorite board game as an inspiration. Form grids and use candies as game pieces. A good one to start with is checkers! You can get rid of those candies one by one as the game progress. Just a friendly reminder: After getting most of the candies on the board, allow your toddler to win the last game and commend him/her for doing well and beating you. This is to minimize his/her tantrum tendency. Toddlers always love to win! Parents can say, “You can have all the candies you want after eating dinner,” or “Eat this apple first then I’ll give you back the bag of candies”. Your little toddler would likely obey because in their own sense of logic, it’s all about eating and getting more candies after. This process makes their stomach full and decreases their craving for sweets later. You may also want to keep a tradition every Halloween that nobody can go trick or treating without completing a full course dinner. Some parents may say that Halloween is just one of the few days in a year that allows children to indulge in sweets. This one’s true! Although considered unhealthy, eating lots of candies in a day or two wouldn’t ruin their entire health that much. Besides, children would not be able to consume all the candies in one sitting, so you may have to worry less about them eating unlimited candies during Halloween night. Remind them that their unlimited candy privilege is up until the morning after only, after which, they need to give the remaining candies back to you. Also, never ever forget to ensure they brush their teeth and to drink lots of water to help flush away the sugar in their body.